The We All Belong project started a year ago, when I was a second-year film student at Mt. Hood Community College. As part of my practicum class, I was instructed to create a project for a non-profit group. I approached Angela Jarvis-Holland at NWDSA, where I’d been a part-time staff member for a couple of years, and asked her if she’d want to be the subject of a documentary. She jumped at the chance to spread the word about the new Kindergarten Inclusion Cohort and granted me access to a Cohort session and agreed to help arrange interviews with some of the parents enrolled in the Kindergarten Cohort. Along with two of my classmates, Emily Morris and Matt McKague, I filmed two days’ worth of footage, including interview segments with NWDSA staff members, as well as Michael Bailey, President of National Disability Rights Network and Eleanor Bailey, speaker and community advocate. We discussed what segregation means in the 21st century, how it affects children in the long run, and how programs like the Kindergarten Cohort can help parents fulfill their dreams of an inclusive life for their child. Most special to me were the interviews with the mothers enrolled in the Cohort program, who graciously shared their dreams and fears about their children as they head into kindergarten. Their testimonies struck me as so honest and powerful that I couldn't wait to share the project with others. Angela was excited about the initial 20 minute-long cut of the video and wanted to share it with attendees of the 2012 All Born (In) conference in April. It was thrilling for me to see the reactions of the participants as they viewed it for the first time, along with a few hundred other parents and educators. The reaction from ABI attendees and others who saw the video at private screenings made me think that maybe my humble class project had turned into something more meaningful than I’d ever anticipated. I spent the summer re-editing the short; I added photos from Jodi Collins’ beautiful photo awareness campaigns and other graphic elements. I was challenged by Angela to find a way to add close captioning, something I’d never done before. With the generous help of NWDSA dad Jonas Hinckley and LNS Captioning, I was able to successfully subtitle the video. Grant money enabled us to purchase a duplication machine and the necessary equipment to create our own DVD duplication operation at the Resourcefulness Center. As a result, we have a very polished and professional video package completed almost entirely with pro-bono work contributed by talented parents and community members. Since its release, We All Belong has traveled the country, being shared at educational and inclusion conferences, and the feedback has been positive and heartwarming. The DVD was a labor of love that took over eight months to complete and is a fantastic example of what a parent-driven, grassroots movement can do. I would like to extend my thanks to the families who participated and shared their thoughts and experiences with me, and to NWDSA for partnering with me on this (and hopefully future) projects. 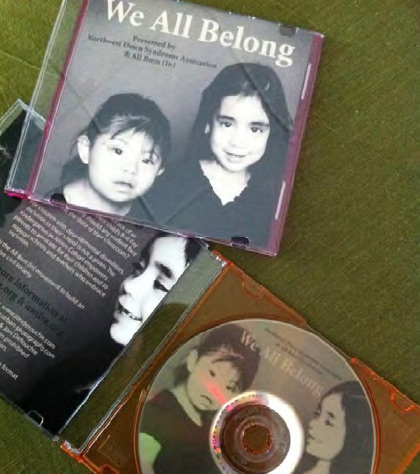 Editor’s note: You can purchase We All Belong as part of an “Inclusion Awareness Packet.” All profits from the sale of the Inclusion Awareness Pack go directly to funding the Kindergarten Inclusion Cohort. 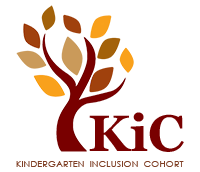 Please visit the new All Born (In) website at www.AllBornIn.org to learn more and buy the DVD.